A few months ago I decided I would start trying to make my own baby food. Nate was at the age where it’s recommend you start introducing solids into an infant’s diet so I thought to myself “Why don’t I just make my own food? It’s probably faster and cheaper than buying jarred food.” Well, flash forward almost four months and I’m here to tell you I caved. I mean, not 100% caved but more or less I did. I realized just how hard it was to keep up with making my own baby food. I had made enough peas, carrots, sweet potato, green beans, and corn that there’s still some in my freezer but I quickly noticed that I was always feeding Nate the exact same combinations and he seemed to be getting bored with them. Meal time started becoming more like a chore for us. He would fuss and cry in his high chair and I would start getting frustrated and upset which only made the situation worse. I decided I would try out a few jarred foods and see if the introduction of new tastes would intrigue him. 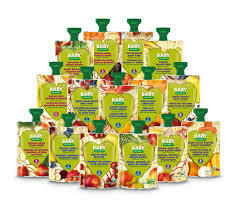 I bought some of the Baby Gourmet squeeze packages because I really liked all the different flavours they mix together and because they’re 100% organic. Nate seemed to LOVE them too! His personal favourite is the pear, banana, and pumpkin. It sounds strange but I’ve tried it and I must say, it’s not too bad! Sure, it still took him some time to get used to these new foods but after some persistence on my part, he’s grown into a great eater! I still continue to add my own homemade foods into the prepackaged ones as well so it’s not like I wasted time and energy making baby food that he won’t eat and that will just take up space in my freezer. I started out my journey convinced that I would never make my own baby food (see previous post) which then morphed into me saying that I would never buy jarred or packaged baby food but here I am now saying that I’m so glad I do both. It really doesn’t have to be one way or the other. It doesn’t make you a hero if you make your own baby food and it certainly doesn’t make you a bad parent if you decide to buy. In the end, all that matters is your child and making sure they’re getting all the nutrition they require. Nate is perfectly happy and content during meal times now. He no longer fusses and refuses to eat and I no longer feel like a failure or that I’m losing my cool with him and the situation. I’m quite pleased with how far he and I have come on his journey together. 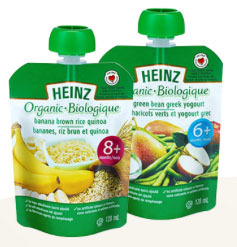 So, in case you’re interested in some of the prepackaged baby foods I buy, I’ve posted some pictures below. If you click on the name it will take you to their website! Baby Gourmet is made using all organic ingredients. They create really unique and tasty combinations that Nate seems to really love! They’re proudly Canadian (yay!) and are super easy to take with you on the go. Nate’s just starting to learn how to squeeze the package with his hands to feed himself. I often use about half then add in one or two of my homemade baby food ice cubes then refrigerate the left over package. Super convenient! 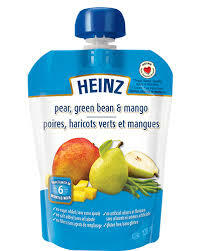 I’ve also started giving Nate the Heinz brands of squeezable baby food as well. My grocery store had a sale on these last week so I stocked up. So far he seems to like them. I know in 2014 there was a recall on certain brands due to packaging errors so I’m always mindful of that and checking online to make sure everything I give him is still safe. 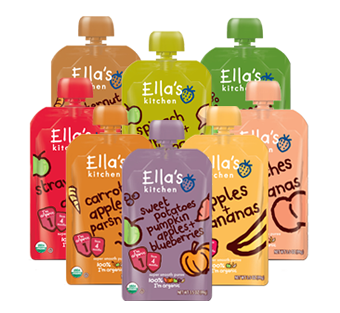 I also recently bought these Ella’s Kitchen food packages but I haven’t given them to Nate yet. I started introducing meats to him and some of these packages contains veggies or fruits he’s never had before so my plan is to make sure he has no meat allergies first and once I’ve gotten through the chicken and beef purees (so gross by the way!) I’ll start giving him these. Thanks for reading! And like I said, it doesn’t matter whether or not you feed your baby homemade or store bought food. All that matters is you’re feeding him or her a well balanced diet! Previous Post Spontaneous Trip To Cobourg! You definitely should! It’s a lot of work but it is well worth it. 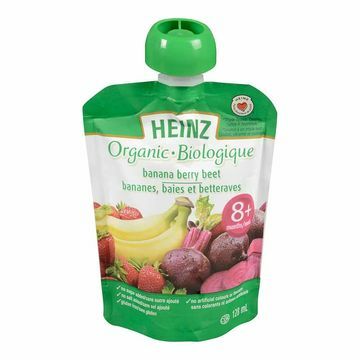 I’m happy where I’m at now because I know my son is getting a much broader mix of veggies and fruits now with the additions of the mixed pouches! For future reference whenever you do have kiddies, I’d definitely recommend starting a few months before you’d be introducing the baby food. I spent at least three six hour days in the kitchen! Thanks for stopping by Candace! I used to make my own baby food too!!! You’re right, after a while it gets pretty hard to keep up with. Our favorite was apple blueberry. My oldest LOVED it! Yes! I’ve noticed my son LOVES blueberries too. It was the first fruit he enjoyed and wanted more of! Blueberry mango puree is probably his absolute favourite at the moment! Thanks for reading!